The Nuclear AMRC has placed an order for a state-of-the-art machining centre which will be the first of its kind in commercial operation. The StarragHeckert HEC 1800 will be the first machine outside Starrag’s own facilities to be equipped with the new planetary turning and milling (PTM) technology. The PTM device (pictured) combines an extendable boring spindle with two radial turning tools, adding milling and turning capabilities to a horizontal boring machine. Together, the HEC 1800 and PTM provide seven axes of movement. The PTM system is gaining strong interest from companies producing large casings and vessels for the power industries, oil and gas, and heavy transportation. Nuclear AMRC members will have an exclusive opportunity to work with this new technology. The HEC 1800, which measures some 15 metres in length and is capable of taking components of up to 20 tonnes, will also include other advanced features such as a 200 bar through-spindle coolant delivery system. 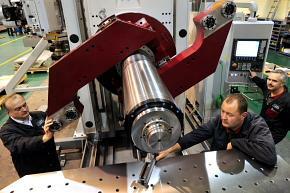 The machine will be installed in the Nuclear AMRC building in South Yorkshire when it is completed. In the meanwhile, a Starrag HEC 1600 horizontal boring machine is being installed in the interim workshop on the Advanced Manufacturing Park. For more information, see the Research equipment page. Nuclear Power Delivery UK has signed new supply agreements with BAE Systems, Doosan Power Systems and Rolls-Royce. The agreements build on the memoranda of understanding (MOUs) signed by Westinghouse UK and the three top-tier suppliers in September 2008. Westinghouse has subsequently formed the NPD consortium with partners Shaw, Toshiba and Laing O’Rourke. Details of the MOUs are confidential, but the agreements reinforce Westinghouse’s commitment to ‘buy where we build’. Areas covered by the agreements include manufacturing and components, supply chain and logistics, and engineering support. Rolls-Royce revealed that it will support NPD in areas of engineering, manufacture and supply of critical components for the heart of the AP1000 reactor system. The group will also explore the provision of nuclear engineering, technical support and supply chain management expertise. Westinghouse and Rolls-Royce are both founding members of the Nuclear AMRC, and play an active role in our own research and business support programmes. UK nuclear developers Horizon and NuGeneration will choose between the Westinghouse AP1000 and Areva EPR following the conclusion of the government’s Generic Design Assessment later this year. In August 2010, NPD UK signed a preliminary design contract with UK developer Horizon Nuclear Power for Horizon’s proposed new station at Wylfa, North Wales. For more information, see our page on UK new build plans.